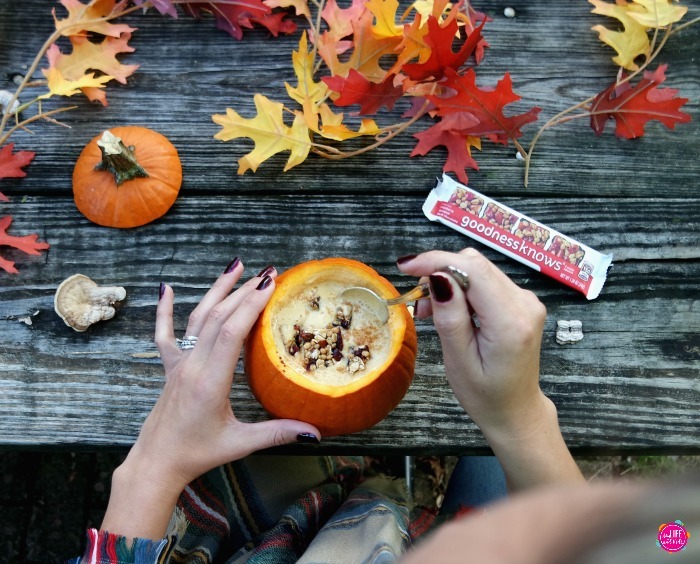 It’s no secret that I love fall. It’s the season of apple picking and farm festivals. Jumping in piles of leaves and cozying up with a good book. 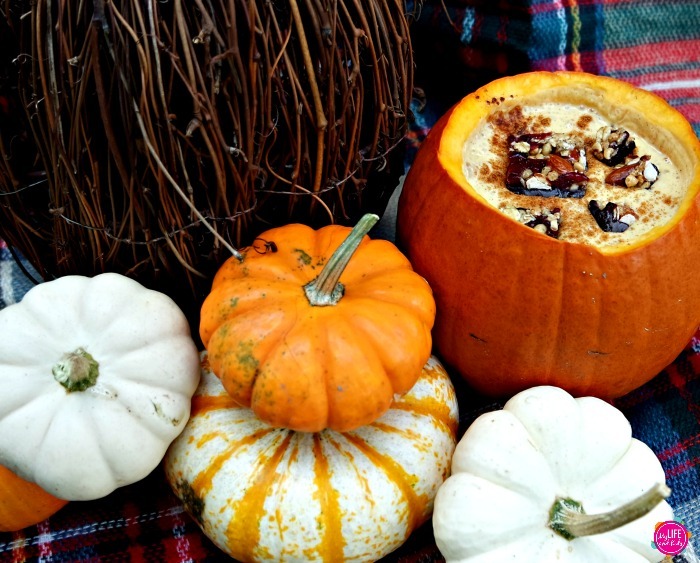 But most importantly, it’s time for PUMPKIN SPICE EVERYTHING. It’s like a switch flips, and all of a sudden my body is craving pumpkin. Who even knew that was a thing? 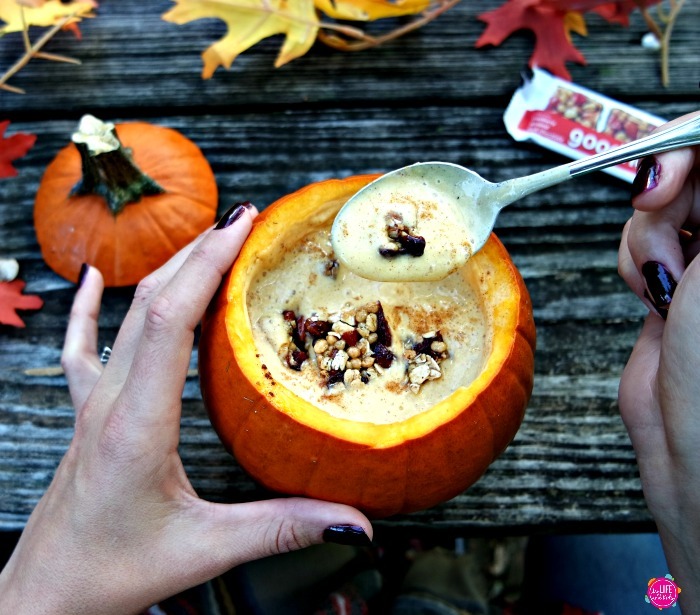 You may remember that I also love smoothie bowls, so I set out to celebrate the season by creating a pumpkin spice smoothie bowl. And – I’ll just be honest with you – it is AMAZING! (And it’s pretty healthy too!) My kids and I have both been devouring these for breakfast lately. Luckily they’re incredibly fast and easy to whip up. 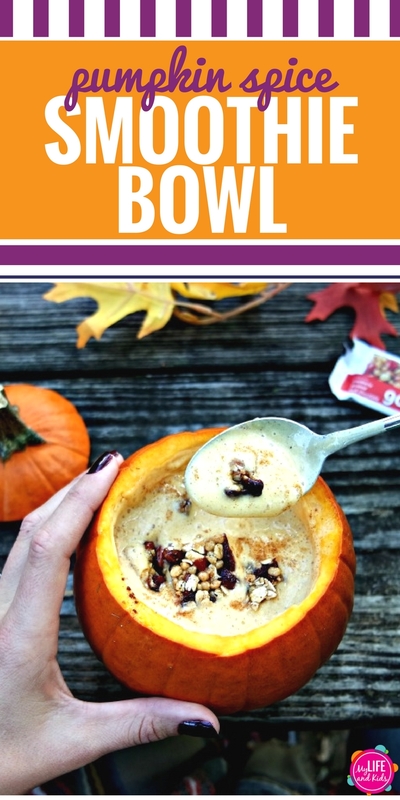 And while my preference is to enjoy mine out of an actual PUMPKIN while I sit in my backyard enjoying the falling lives and crisp fall air, I would like to assure you that they taste just as good when served in a boring cereal bowl and eaten while standing at the kitchen counter. I like to top all of my smoothie bowls with goodnessknows snack squares. With the goodness of whole nuts, real fruit, toasted oats, dark chocolate AND no artificial colors, flavors or sweeteners, goodnessknows snack squares are the perfect topping for my morning smoothie bowls. And – my favorite part? 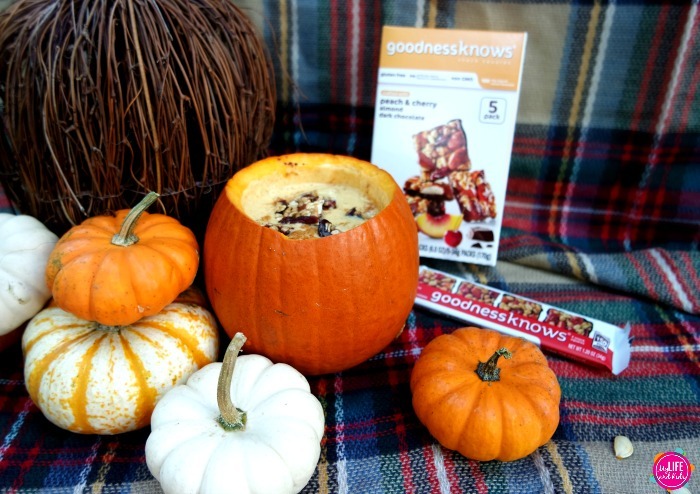 In addition to being delicious, goodnessknows snack squares are now gluten free. (Look for new product packaging in store that is marked with “gluten free” on the label.) Click here for more information. Makes enough for 2 – 3 smoothie bowls. Toss the ingredients (minus the toppings) in your blender and mix them up until smooth. Add in some honey if you really need some more sweetness. 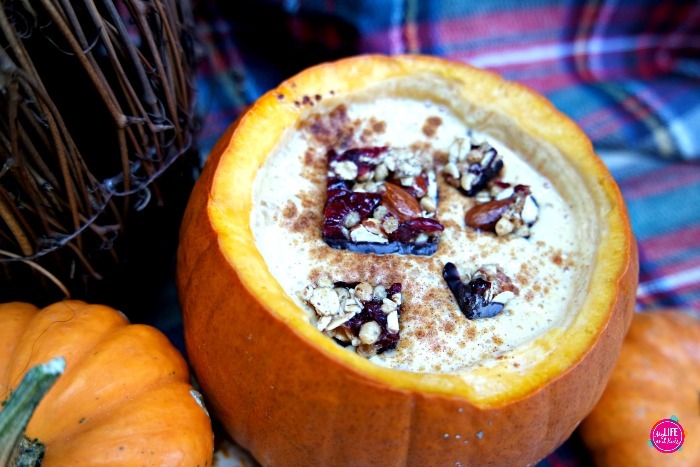 Pour into a bowl (or a small, carved pumpkin), and add your toppings! Start with a dash of cinnamon and then add your goodnessknows snacksquares. 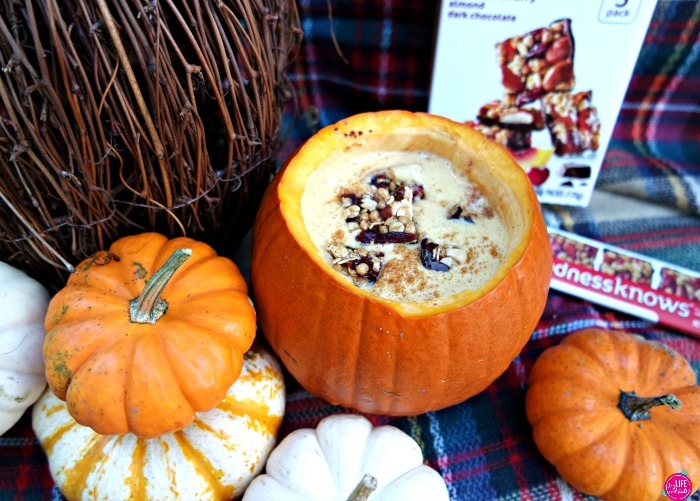 Personally, I like the combination of cranberry, almond and dark chocolate with my pumpkin spice smoothie bowls. But all three of my kids swear that peach, cherry, almond and dark chocolate is their favorite. Because of their unique size and delicious ingredients, they’re the perfect topping for your smoothie bowl!